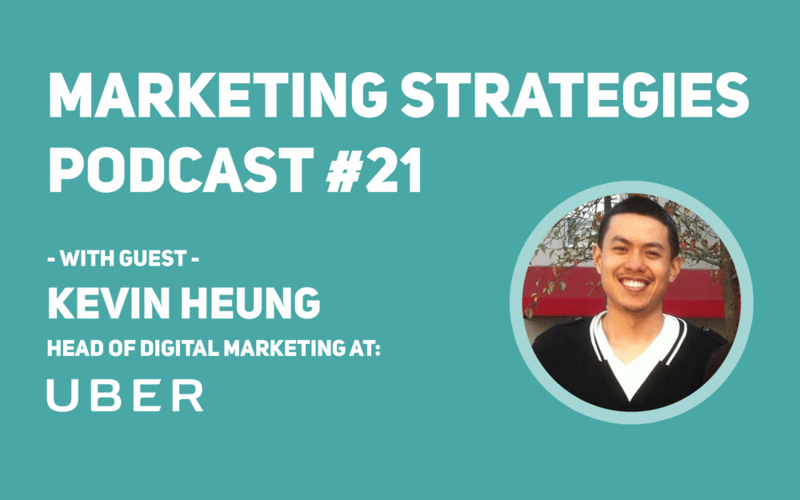 I speak with Kevin Heung who is Head of Digital Marketing at Uber. This is a fascinating look into how Uber conducts their digital marketing and how they acquire new users. We discuss paid search, paid social, display, content marketing, organic social and search. Our conversation switches between Uber Rides and Uber Eats. Both are different marketplaces with their own stakeholders. My best piece of marketing advice is always challenge the status quo. Best practices are stagnant things that we always need to challenge, right? Finding better ways of doing things is always important even though we believe you found the best way. Best marketing advice, always challenge the status quo. The example was like being targeted versus being broad, right? It was going against the grain but we’ve seen huge success doing so. Going against certain attributions is another one. I’ll say always challenge the status quo. Find the best output but then always revisiting it trying to find a better way of doing things. A book, so to be honest I’m actually not an avid book reader at all. I’m not a frequent book reader. I’m not a big fan of business related books as well. However, one thing that I do recommend and I always constantly do myself is I recommend just reading about history, right? Whether it’s recent, ancient or whatever, because I think it’s important because it’s important to know your history because it tells us how we evolve. It tells us what decision was made to get to where we are today, and also influences what are the things that could be useful from taking decisions today in some of the situations, right? Finding inspirations. Finding those thoughts. Finding the mistakes that have been made that you don’t want to necessarily make today, right? I think it’s always important to understand history and I actually recommend that rather than a particular book. I want to say very basic it’s Excel. I mean, applicable for most businesses, most situations, low cost. You can take raw data and get many types of insights from it. You know, obviously when it comes to big data and things like that you would need to utilize a more sophisticated tool like whether it’s Python RStudio, but I think for most marketers I think Excel is definitely one I cannot live without. I actually really enjoyed Domino’s Turnaround campaign. I’m not talking about just tactically but the decision to openly admin what they heard from their consumers. Being very consumer focused and very upfront on the problem that they had and basically talked to consumers about what they’re doing to change it. I thought that was a really great campaign. I like listening to How Stuff Works, Stuff You Should Know, Business Wars. Those are the three podcasts I’m most interested in. Hello, and welcome to this episode of The Marketing Strategies Podcast. Today I’m joined by Kevin Heung, who is head of digital marketing at Uber. Before moving into the position of head of digital, Kevin was Uber’s senior growth marketing manager for the US, Canada and Latin America regions. I’m sure everyone who’s listening today will have heard of Uber, but I’m particularly interested to learn about the digital marketing strategies Kevin and his team use at Uber to grow the business, so let’s dive right in. How are you doing today Kevin? Yeah. I’m great. It’s a real pleasure to have you with us today. It’s an amazing company that everybody will have heard of and many people, most people, I can imagine all of you. It’s really great to get some inside information into how your team operates, so I appreciate you being with us today. Appreciate for you having me on, so happy to discuss some of the initiatives that we have going on here at Uber. Fantastic. For the listeners to get started, please tell us a bit more about Uber and what your team does and what you’re responsible for within the business. Yeah. For those who don’t know about Uber, we’re essentially a platform to make transportation safer, more accessible, but in addition to transportation we’re also helping people order food very quickly. We’ve branched off to that industry itself, and just reducing congestion in cities by just getting more people into fewer cars, in addition to creating opportunities for actually people to work on their own terms. Right? We work heavily with a lot of the cities and a lot of local [inaudible 00:02:30] entities to provide those opportunities and going beyond our typical initiative as well. We do have initiatives in the freight side, healthcare and even employee travel, and obviously our more innovative standpoint as far as self-driving cars and Elevate. It’s amazing how Uber is branching out overtime. Do you see that growth rapidly moving into different industries and into different areas? That’ll be fantastic to see. Anyways, actually I have a small story around Uber Eats. We have a sales team internally and a client who’s based a few hundred miles away from us. It’s been so hot recently in the UK, and I’m sure it has in other parts of the world as well, but we’ve had some conversations about the weather and things like that. Some of our clients have told us that they’re so hot sat in their office, so we’ve actually used Uber Eats to send out frozen yogurt from different places to our clients. It’s just a lovely touch, but it just shows the convenience of Uber Eats and how easy it is just to order something online to the driver or the rider actually make their way over to a client’s office, and our clients phoning us 10 minutes later saying, “Thanks very much.” It’s exactly what they need. Yeah. I mean, who isn’t happy to get frozen yogurt delivered? You’re in this marketing team. You have a team of how many people that you manage there? Currently my team’s been 23. I expect it to grow to probably 26/27 by the end of the year, and that expands across the ride side of our business and also at the Eat side of our business. To clarify, my team’s actually entirely focused on Latin America, which is actually one of our largest regions at Uber. Fantastic. What are the core things that your team is focused on? What are the KPIs that you’re trying to influence? To give a little bit of background about my team structure, so my team’s responsible on the digital side clearly, but also not just on the paid side. Paid marketing is one aspect of it but we also focus on some of our earn media side as well on our website. To give a little bit of detail, my team is broken down by channel, which is the typical paid search, paid social, display affiliate side. Also, going more towards the website is actually landing page testing, web. It includes our Uber.com initiatives in the region as well. Then also on the earn side and more on the content marketing side. This content marketing lives across organic social, our blog and also in media and press as well. The focus spins across different initiatives such as our brand efforts, acquisition and engagement, and also spins across different products such as ride and Eats. To dig even deeper on the ride side, we actually are a double-sided marketplace so we have riders and drivers. On the Eat side we actually are a triple-sided marketplace, which is eaters, couriers and also restaurants, right? Our KPI spends vary differently depending on the initiative and the product, and within the product the type of audience that we’re trying to target. Yeah. It sounds like you’ve got your work cut out there. Yeah. Absolutely. I think they’re driving to a typical side on the business side of things I think that trips and first orders is definitely … if I had to sum it up it’s one of the main KPIs as far as the business metrics goes. That’s when we really consider someone and Uber user, right? An Uber customer. It’s not just sign up or installs, but really just them taking that first trip. Taking that first order is when we really consider them a true Uber user. A lot of what you’re looking for really is new business and you’re also influencing repeat business and customer loyalty. Yeah. Absolutely. I think at the end those are the metrics that we need to drive, right? Obviously orders, first trips also goes into revenue, gross bookings and obviously LTV as well, but depending on initiatives like I mentioned, it will dictate the KPI we will look at for that particular campaign, but at the end of the day what we really want to drive to is those orders and growth, right? The prime example I give is brand initiatives. In our brand initiatives we definitely … Very difficult to tie our brand initiative directly to first orders immediately. You do have other KPIs such as our brand health tracking and tracking the health of the business such as favorability, awareness, perception. Perception as far as safety, quality and access, but then the reason you want to improve your brand perception and improve your favorability is so that one day they will then take first orders and trips, right? At the end of the day that is the end goal but then depending on the initiative you might look at an earlier indicator KPI to then make those business decisions. Yeah. I guess then you’re looking at the actual value of an order and potential lifetime value of a customer versus actually how much each marketing activity costs to acquire that use as well. Yeah. Absolutely. LTV is definitely a metric there we look very keen onto just because it gives a better perspective with our decision making as far we don’t want to look at just short term gains but also in the long term what is that value of that customer, so we’re willing to pay that amount in order to acquire that customer today. I saw that your area, Latin America, is one of the fastest growing regions, is that right? Did I read that correctly? As far as first trips goes, and that’s based on just the amount of time the market has been active and then how long it’s taken for us to get to the amount of first trips and trips that we have today. If we were to pull back a little bit to some of the things that you mentioned there, which is the channels being paid social, paid search, display, affiliate content marketing, which area is the most successful for Uber actually acquiring new users? I will say it depends on the product. I would say social is definitely a big one of ours just because of the size of the reach. Also, social is actually … You know, Latin America users are actually one of the most interactive when it comes to social. Definitely you do imagine seeing a lot higher click-through rates, conversation rates on social in Latin America compared to the rest of the world. In addition, CPM is actually a lot lower in Latin America as well just because a lot of the competition in Latin America has been very focused on the display side. They do leverage social but a lot of it always on the brand efforts as well and the reach efforts, but not as much on the acquisition side, so you do see those nuances. I do see a lot more players now in Latin America, especially as global companies tap into Latin America do use and leverage social a lot more for acquisition, so we do see that competition picking up. On the social side is the most versatile as far as getting riders using more app and cell focus and drivers, which is more web focused. On the display side we do see a little bit more success actually on the app install side versus the website, and we do see just based on conversion rate the app side is we’re able to get a little bit more cheaper inventory, a little bit more success as far as the optimization and volume there. Very interesting. On the social side, what is it that you’re finding as the most successful type of ad campaign that you’re running, or is it specifically ad campaigns that are working for you or are you really engaging through organic as well? For app install, it’s kind of across the board. We do have our SEO efforts, right? For the organic side and that’s really content driven. Really building that quality and that ranking on the SEO side. On the app side a lot of it is based on just pure optimization on the app install units. What we’re seeing more and more now is like the biggest players like Google and Facebook are becoming essentially more of a black box when it comes to app installs. I think Google’s movement to UAC is the clear example of that. They actually stopped offering app install for search for example and actually require it to be UAC. I think a lot of it is just based on data and being able to offer that amount of data for them to optimize towards. We do leverage some of these bigger partners but it has become a little bit less ability to control some of our app install campaigns versus web. On the social side in terms of actually ad campaigns through social, what are you finding works well there? Is it trying to target people when they’re looking for a ride, or are you getting brand awareness really through social? Yeah. I think that we do leverage them for both. I will say more on the app install acquisition side more than the brand side. However, we do leverage it for brand as well. The reason is just based on, on the brand side some of the KPIs you look will be very different. I think Facebook on the brand side is really great for reaching additional people and being accurate as far as the reach goes, but the challenge has been on Facebook is really on the viewability side. A lot of our brand initiatives involve video, a lot of very creative imagery that quite frankly Facebook has one of the lowest viewabilities of what we’ve seen. I think that is also seen across other advertisers as well, which is why we actually have been leveraging Facebook for kind of like a reach extender, but definitely not the primary channel we would leverage for the brand initiatives. Versus in the acquisition side due to their OCPM bidding being able to optimize appropriately, we have seen a lot more success there, which is why we leverage them for that a lot more. You’re saying actually Facebook you’re seeing a very high reach compared with other channels. We do see a high reach but however the viewability is actually very low. Oh, so the actual views of your videos is low compared with the actual reach you can achieve. It’s the view but also viewability. The typical definition of viewability is having 50% of the ad viewable for two or three seconds, right? Even though a view is conducted a lot of times that unit doesn’t meet that criteria of 50% of the unit being viewed within two or three seconds, right? Because of that the impact is potentially less because technically even though the impression is served they actually can’t really see the ad not to the period of time. It’s probably just a scroll by impression. Yeah. People are just flicking through Facebook and it’s actually tracking as a view but you’re not actually getting the value there. Yeah. Exactly. Versus something like YouTube where viewability is a lot higher for truly for example you pay for a 30 second view, so if you’re talking about value-wise, it’s actually a lot more valuable than just the reach on Facebook. I’ll say that we make those decisions based on a waterfall logic of the most efficient channel when it comes there down to the least efficient channel. The only benefit of Facebook is the reach component that they have. You’re finding YouTube is actually more effective there and you’re actually using video ads that can’t be skipped or video ads that can be skipped, or what were you seeing on the skipability? I will say it depends on the type of deal that we have. The way we will evaluate that is really by cost, right? Which really expands to understand, hey, that’s skipable, non-skipable, which one is more impactful as far as we do Lyft surveys? However, we haven’t had any stat sig results there yet, so because of that we really evaluate it based on cost per completed view, right? That’s how we evaluate which one’s more efficient. The thing is like the non-skipable one I think the misconception is that that’s basically everyone view it. There’s actually a large drop-off when it’s non-skipable. A lot of people just leave the video for example when it’s non-skipable. They’re going to continue on. There is a dropout rate there. Then you pay regardless if they finish the view or not. They pay it based on that entire non-skipable inventory. You have that cost there. You evaluate what is the completed view rate of that versus the completed view rate of a skipable where you pay only when someone hits 30 seconds or more, right? Then you evaluate what is that cost per completed view and then you make that decision of how, should you do non-skipable or skipable? That’s the way we evaluate that across. It’s actually very different by country. Some country we would use skipable and some country we would use non-skipable. From there is your goal really to get people to install the app? That’s your call to action. Everything we do is to drive growth, right? First orders, trips, people taking trips. Those business metrics, right? But there’s a difference between acquisition and brand in the sense that acquisition in my sense is that we want them to take an action right now, versus brand, we want to influence something else whether it’s favorability, brand perception, so they would take an action later. Because of that, that later action could be six months from now, it could be a year from now. Really evaluating that campaign based on the amount of insights you get is not very fair because if you were to evaluate based on that you would just essentially never run a brand campaign. Because of that we split what the goal is for that individual campaign and then optimize our KPI based on that initiative. Everyone is going to have a different goal really I guess, isn’t it? Yeah. I think that it is … My team does run those brand campaigns and acquisition campaigns and engage in the campaigns, but we set those aside to ensure that this is the initiative of this type if campaign so we know what KPI we’re really focused on. Obviously to be honest a lot of assumptions have to be made there but I think those assumptions need to be made in order so that you can make the right decision for the long term. I think acquisition is fairly easy depending on your attribution model but when it comes to brand initiatives there are some assumptions you … have to be made, and obviously as you run these initiatives, overtime you want to set up the right cadence so that you could then measure the business impact in the long term. What are you actually using to track or what are you using to actually make sure that you’re successfully understanding who’s taking those actions? Yeah. Because if you say like somebody watched a video for example and you say that the action might not happen until a few weeks or six months later perhaps, how are you actually fully understanding who is taking those actions? Yeah. I think that there’s different KPIs on the acquisition side. From a day-to-day optimization as in let’s say a channel manager needs to optimize on their platform, they leverage the last click metric, right? The reason they use last click metric is because that’s a metric that’s more realtime that they can actually take action on. Then on a high level for us to do the allocation of which channel is really the most effective, we do a lot of incrementality testing and from there we’ve developed an MMM model to help understand truly what is the impact of that channel. Imagine at a granular level if a channel manager was to do a creative testing, they cannot use an MMM model to tell you which creative is doing better, because MMM models is very difficult for them to be accurate at a granular level. The channel manager will then optimize, “Okay, if this creative is better on last click basis then this is the better creative.” Then at a high level when we want to do budget allocation to ensure which channel is really driving the most value of measuring it, we have our MMM model to evaluate, okay, social is actually driving this much incrementally. This is the actual cost per first trip that they’re doing. This is how much we’re going to allocate to that channel. Okay. Just for listeners and for me actually, tell us what you mean by an MMM model. Yeah. MMM stands for media mix modeling. Essentially a model to evaluate your spend and the true effectiveness of your spend by your media mix, right? Determine if you have a million dollars should you allocate 50% of that to social or should it be 30% to social? You really need a media mix model to really understand the true impact, because if you were to use just a basic last click model, which is a great model to use in the beginning stages, but as you become more sophisticated last click has it flaws because it doesn’t really measure what is the impact of your impression to the organic traffic. The media mix model removes that bias of last click versus not last click and really just measure okay, what is the impact of your real medium to the overall business? Then allocate investment based on that. That would be kind of like a multi-touch really or? Kind of like a multi-touch. I would say multi-touch is more also based on the actual event that happened versus a media mix is actually a little bit more high level and it evaluates things like maybe correlation to spend to different first orders depending on that week, right? It looks at different correlations and different features of the model to then determine what is the most applicable, because media mix is great if it’s … It still has its flaws because of the wall of gardens like Facebook and Google, because you cannot have every single data touchpoint and tie them across these different channels, so even then your multi-touch attribution has its limitations because of that. That’s really, really interesting. It’s a different level to what we’re doing currently in our business. Maybe there’s a number of listeners online that are not fully onboard but that resonates fully with the scale of Uber, so thanks. That is very, very interesting. In terms of like a messaging, you know, obviously you’re creating a ton of adverts, a ton of campaigns, releasing a ton of material. I know that you have different areas of the business rides and Eats and things, but what type of messaging are you finding that resonates most? Because I guess you do lots of different experiments to try different wording and different messaging. What do you find really resonates most and helps people actually make that install or take that ride or order that product, order that eat for example? A very good question. I’ll say there’s no silver bullet to be honest Matt. I’ll say that there are different messages that work depending on the type of audience and depending on the KPI. For example like safety is one thing that we’ve been highly focused on at Uber and we believe that we’ve made a lot of progress on improving us there, but also that showcasing those things we’ve seen that the features, you know, showcasing the features has helped showcase that, which has helped us a lot, right? To improve safety perception, right? The message is very different depending on the KPI. Sometimes showing features is better for improving the perception itself. Sometimes for acquisitions it’s completely entirely different where actually acquisitions we’ve seen that actually showcasing the accessibility and showcasing the pricing could be a better option, right? It really varies I would. One thing that does stand out I’ll say is more on the Eat side where we feel like we definitely want to leverage our partnerships a lot more. We have seen that that has improved our marketing effort a lot more based on the partnerships we built with McDonald’s for example on Eats and the partnerships we’re building with more and more bigger partners and even small partners as well, and showcasing that option and showcasing that availability has helped us a lot. That’s on the Eat side. Does actually advertising certain items of food at certain times of day actually help as well? Is that something that you do? Yeah. It definitely does help. We do see that having that more targeted messaging does help a lot. Especially not even just targeting time of day but you think about Eats, it’s something that the availability of a certain food needs to be within a certain area. Ensuring that we’re not just showing a generic option of food but showing actual food that’s within your area that you can actually order right now definitely has improved performance, and showing that in real-time and having live feeds in order to make that more dynamic. We’ve definitely seen a lot more success there rather than having just a generic type of food product out there that’s not necessarily tied to a particular restaurant that you have access to at that moment. Yeah. Absolutely. One of my podcasters is actually with someone from Deliveroo and it was really interesting actually. One of the things that they do is advertise certain products at certain times of day and just to spark that interest and make people actually make that click or actually make that order or do that install really. It’s really, really interesting. The only challenge I would say when it comes to time of day or depending on the channel, sometimes when you get super granular you do sacrifice some of the scalability. Certain channels let’s say social, requires a certain amount of events, right? For them to make certain types of optimizations, so if you get too granular sometimes what we’ve seen is that, yeah, performance is great from a cost per CPA standpoint but your scale goes significantly down. Especially in our business where we are a very [hypertrophe 00:22:00] type of company. We do want to scale. We do have to make that balance about granularity for efficiency but not sacrifice the scalability at the same time. One of the things that you mentioned earlier was actually content marketing as well. You said that’s an area that you focus on a lot. I’m really interested in that actually because it didn’t seem like content would be a huge area for Uber. I know that’s something that comes under your area particularly. Is content and SEO and driving people to the web, is that something that’s a big on the radar for Uber? Yeah. Absolutely. I think SEO is definitely a huge reason why we want to focus more on content marketing but also you know, especially Latin America, content marketing is the content itself. It lives in different places. It lives on social, it lives on our blog, it lives on media for example, and a lot of our drivers and riders actually absorb information from these different distribution networks, right? We leverage content for the SEO side definitely but also a way for us to communicate key things to our audience. Whether it’s searching for a particular initiative on our blog or being notified that, “Hey, we have a new toll product for a particular market.” Right? Which is why even if you look at our distribution networks like social is actually very granular as well. We have a particular handle for Mexico. We have a particular handle for Columbia, because in reality even though we are a technology company we’re a very local company. We are on the ground. We are celebrating these cities and helping these cities as well and working closely with them, so we have to be a little bit more accessible to them directly, which is why content is a big focus of ours. You’re really using content as an education tool for your users really rather than to try and help people understand about different cities and places. Really, it’s more to help them understand how to use Uber more effectively. I’ll say it’s across the board. I’ll say we definitely leverage it for everything from SEO, from letting people know about the content that we have, the new features that we have. Just everything like education-wise there. Also, we do want to build specific stories out there. We have driver stories for example. We have really great stories on our drivers, very impactful and things that we find very inspiring that we want to share this across to our users, right? We want to make sure that that message gets out there, so I’ll say we leverage it across the board and we have different KPIs depending on that. I was just doing a bit of research before we started talking and I noticed one of the highest performing … actually the highest performing blog article that you have is how much do drivers make with Uber. I know that is probably something that’s searched for a lot, maybe even by people who don’t want to be Uber drivers. I know it’s been in the news a lot and things like that so particularly information all useful. Yeah. Absolutely. These type of searches, these type of interactions with our networks like distribution channels also helps us a lot to inform what are the things that we need to work on to improve on so. Yeah. Fantastic. I was just going to come onto something which is quite interesting. Obviously GDPR has come out in the UK and Europe and data privacy has been a very big focus in the news at the moment, particularly with Facebook and things like that. Obviously with Uber you need to target and attract a mass market. Any consumer in the cities you operate in effectively. How are you finding things are changing with tracking and the ability to reach your audience? How do you think things will change overtime based on the changes to data privacy? More and more it’s going to be more difficult to get very granular insights on your audience and the type of targeting you can do I’ll say. I think that for Latin America in particular we’ve always made sure that as far as our particular product, our particular sites that we are up to par as far as what we believe is very strict data privacy laws. Obviously it’s even more strict in Europe but we take that standard across the board. We definitely want to cover all our basis, even if it’s in fact not something knocking on our door right now. We always want to make sure we’re ahead of that. I think from the marketing side, what I have seen is actually some insights that you typically would be able to get and garner before easily from your partners is becoming harder and harder. Even from a consumer side like just from the advertising side, you can quickly see just based on Facebook, which arguably has been hit with this one of the hardest, is removing some of the features, some of the insights that you can get from them. Right? Facebook audience insights is something that was very accessible before for you to either get insights on people on Facebook or even upload custom audience to get more insights on Facebook. Facebook was a great source as far as they have really good first-party data on their end that we can leverage to get more insights onto our first-party audience. That’s something that they deprecated because of that. Different things like that I see will be more and more strict and I think that targeting will then become a lot more difficult. Do you see that being literally the way it’ll go is data privacy will carry on being a big news story and actually things will get tighter and tighter? Because I guess as these companies, Facebook and Twitter and other social media companies, Google and the like, have come around. If we put our data out much more freely these days do you think that’s going to restrict and things are going to become tighter as we move forward over the next few years? I think that it’s definitely going to be more tighter. I will say it’s tighter in the sense of data sharing I would say across the board. I mean that data will always be there. The way that data is being captured by every single app that you have, every pixel that’s on different pages that data will always be there but we’ll see that there will be a lot less accessibility to that data more than anything else. That data will always be there and I think the accessibility will be the challenge. Yeah. I was wondering, do you think that data will always be there though? Because I think that’s almost slipping under the radar at the moment where people are going you know, “My data is my name, my email address, my home address.” But actually the websites you visit the steps that you take online, I can see that being something that’s really clamped down on even more in the future. When I say data will always be there as in the tracking will always be there and accessibility will go down. I do agree though there will be more walls placed internally at companies to ensure that data doesn’t go across. Even Google and Facebook you know they have a large display network, right? Facebook has Facebook Audience Network, Google has their entire stack of display partners out there. All these partners are sending data back. Facebook’s pretty amazing. They have Facebook Audience Network where they have data on users. They know device IDs. They know device IDs can join with their device IDs for a single Facebook user. Then they also have Facebook Connect where a lot of developers are integrating Facebook Connect for their login, right? This is all data that’s being captured and I don’t think that’s going away. They’ve already built walls. They’re probably going to be even more strict as far as the language on the walls of how this data cannot talk to each other. Like you cannot leverage this data for training data across this bidding or targeting for example, that those internal walls will be built, but what I’m saying is the data will still be there is I feel like Facebook Connect is not going anywhere. Facebook Audience Network is not going anywhere, right? That’s what I mean as far as the data will still be there. How do you see that changing the marketer’s landscape over the next few years in terms of being able to reach that audience on such a granular basis? You know with demographics targeting user insights? The ability will still be there I think in the next five years. I think it just comes from on marketing standpoint that it’s being more seen as a gray area, right? As far as you know even like demographic targeting you mentioned, right? Targeting someone that is a specific age bracket or targeting someone based on their gender, is that considered ethical? Right? I think it’s becoming more and more of a question, which was always a basic practice on marketing, being very targeted, showing the right message and that’s because you want to ensure the best experience. Then it could also be seen as a gray area that, “Hey, should you actually be segmenting them based on their gender, based on their age?” Right? Then those questions are coming on board. I do believe that there will be more and more broad targeting and I will say thought that Google and Facebook have even developed more and more overtime the last couple of years where broad targeting does offer better performance from an acquisition standpoint, right? I mentioned their UAC. They’ve been developing UAC where it’s like, “Hey, don’t provide any segmentation. Just tell us what you care about which is like install and we will decide, hey should we show to this person or this person? Should we show it on YouTube? Should we show it on Google display network? Should we show it to them on search? And let them decide. What they’ve seen is that the more data the more flexibility you give them the better the performance has been. I’ve seen this firsthand myself. I will say even though you are losing the targeting capability I think that they’ve already even before all this data concerns arose they were already moving towards that direction as far as an optimization standpoint. Do you find that correlates with your experience that you tell them you want app installs and just let them get on with it, show where the right … they know what data they’ve got and show it to the right people. Actually in effect you’re almost not getting access. You don’t need access to the data on the same level because they’re actually doing that for you. If they don’t get enough data their prediction of that conversation rate can be very volatile. A volatile conversionary prediction will mean that hey sometimes they overshoot as far as amount of conversion, sometimes they undershoot in which case it impacts performance. The more data you give them the less volatile that conversion prediction they will have hence you will get better performance, right? It just makes sense mathematically as well. Fantastic. Anyone can do that really, can’t they? It’s just one of the criteria when you first go on Facebook for example you go on and you just decide what your goal is. Yeah. Absolutely. We’ve done many tests as far as is it better to segment versus better to being broad? I will say obviously it really depends on your objective. If your objective is scalability while being efficient then broad has seen more success than very hypersegmented, but obviously if you are in a type of state or a type of a state where you want to get as much as possible but you’re limited by budget so you need to be as efficient as possible, then that’s where targeting may be a little bit better. That’s really interesting that you say it because it almost goes against the grain of what we traditionally know as marketers to segment and find our audience as closely as we possibly can. Now you say really actually go broad and give them the most amount of data to make the best decisions possible. Absolutely. I think that over the last two or three years that’s the trend we’ve been seeing. I think that initially you do believe that hey, being hyper-targeted to the right audience you’ll have the best success, but overtime through testing and through the improvements of their algorithms we have seen that broader is better given the amount of data has been better versus being hyper-targeted. Because being hyper-targeted, one, you have less data to give them for them to make that correct prediction like I mentioned that’s more volatile. In addition, generally the more targeted you are the higher CPM you would see, so that also would go hand in hand with why you would see actually less efficient, less performance, versus going broad. Obviously, that’s not a one size fit all. Like I mentioned, there’s never a one size fits all to everything. It really depends on your objective, your business itself and then you should choose the right method for yourself. It’s all about experimentation as well I guess is trialing, seeing what works and making the best choice for you because it’s going to be different for every business as well. Unfortunately like you said before there’s no silver bullet. Same with marketing really you know, there’s no silver bullet and it’s just about trial and experimentation and seeing what works. If we were to look into the rest of 2018/2019, what’s on your radar? What are the marketing strategies, campaigns, tactics, what are you focusing on for the next year? I kind of mentioned briefly before. I just said partnership is a big one on my mind. I think that partnerships there’s one sense as far as you have a partnership and you want to use that for messaging but I think that I want to focus more time on how us and our partners are leveraging more from a marketing side where we can be actually more integrated with our partners on marketing aspects, right? Whether it’s, what is the best way as far as data sharing goes? Leveraging the different partnerships and whether … You know, even things from leveraging a partner’s domain or leveraging a partner’s presence, right? Being able to have a co-marketing effort to get the best performance from both sides, right? I think that that’s a huge opportunity for us. I think that we work with partners who are at the big enterprises where they have great marketing as well and just finding a better way to integrate. That’s definitely a huge area that I want to focus on. I think that’s a big opportunity, especially on the Eat side. Always getting better with our measurement. I think that I mentioned MMM but there’s always refinements. You know, the thing about these models that you’re building is that you build a model that’s telling you one thing but how do you actually know that model is doing better? Right? How do you validate a model that has all these thousands of features in there? Really developing very sophisticated tests just to prove the outputs of those models so that at the end of the day making better decisions with your investment dollars is always going to be a top focus for 2018, but as we deliver more and more sophisticated models it’s always important for us to validate to ensure that we’re making the best decision possible. Partnerships and measurement are your two core focuses for the next year. I guess you could always come to the point where Uber is doing some other different channels, some other different things that you’ll actually have to start pushing marketing and growing as well. Yeah. That’s the two top things out of like a thousand other things that we’re going to be focusing on so. All right. Well, I’m going to wrap this up so I’d love to take this to our last five questions which is five quick fire questions I ask every guest. Number one is, what’s your best piece of marketing advice? My best piece of marketing advice is always challenge the status quo. Best practices are stagnant things that we always need to challenge, right? Finding better ways of doing things is always important even though we believe you found the best way. Best marketing advice, always challenge the status quo. The example was like being targeted versus being broad, right? It was going against the grain but we’ve seen huge success doing so. Going against certain attributions is another one. I’ll say always challenge the status quo. Find the best output but then always revisiting it trying to find a better way of doing things. Absolutely. I guess that comes into things can change overtime with be hypersegmented, and actually you’ve had much more success with being broad like you say, so you can’t just rest on laurels there as well. Number two is, can you recommend a book to our listeners? A book, so to be honest I’m actually not an avid book reader at all. I’m not a frequent book reader. I’m not a big fan of business related books as well. However, one thing that I do recommend and I always constantly do myself is I recommend just reading about history, right? Whether it’s recent, ancient or whatever, because I think it’s important because it’s important to know your history because it tells us how we evolve. It tells us what decision was made to get to where we are today, and also influences what are the things that could be useful from taking decisions today in some of the situations, right? Finding inspirations. Finding those thoughts. Finding the mistakes that have been made that you don’t want to necessarily make today, right? I think it’s always important to understand history and I actually recommend that rather than a particular book. Okay. Something that might be much more along your line. What software tool could you not live without? I want to say very basic it’s Excel. I mean, applicable for most businesses, most situations, low cost. You can take raw data and get many types of insights from it. You know, obviously when it comes to big data and things like that you would need to utilize a more sophisticated tool like whether it’s Python RStudio, but I think for most marketers I think Excel is definitely one I cannot live without. We won’t be surprised by how many people say that. You know it’s on a podcast recording, the episode with Susan Su last night from Refroge and she said exactly the same thing. What’s a tool you couldn’t live without? Excel. She just loves the spreadsheets. What’s your favorite example of a marketing campaign? Cool. Well, I’ll find some details on that and I’ll link that into the show notes so if anybody wants to go to Mattbyrom.com and find this podcast episode then I’ll put some details in there near the top of the page. Finally, number five. What are the podcasts you listen to? Very, very intriguing for me. Cool. Well, I also like those as well. I’m also interested in those sorts of things as well so we should share a few lists. Cool. Well Kevin, it has been an absolute please talking to you today. A real insight into Uber, the workings and the digital landscape that you have. Very fascinating and I appreciate your time very much. Great conversation. I appreciate you having me on here.